Irony turns to inspiration in James Franco’s latest film, The Disaster Artist, proving that even the world’s worst can be a triumph. A film about the making of the best worst film ever made, an interesting concept for sure but one that revels in muse’s failure and turns it into a comedic, fun and truly inspirational story of passion and drive. Based on the recent memoir by Greg Sestero and Tom Bissell, the writing credits do not fall in Franco’s lap, however, stepping into three of the four roles so confidently taken on by director, writer, producer and star of The Room, Tommy Wiseau, left James Franco with some big, and incredibly unique, shoes to fill. Being such a cult phenomenon, The Room demanded a retelling as equally quirky as itself and that’s exactly what was delivered. The comedy in the film mirrors what was unintentionally funny about its inspiration. 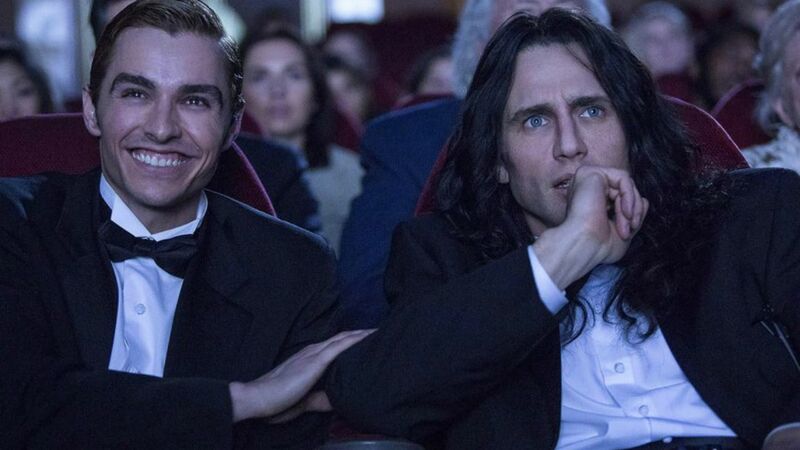 From Tommy’s eccentric, over-the-top energy to his questionable acting ability (or inability), The Disaster Artist plays on what fans of the film love the most and takes you on a journey through the world of Wiseau. The true comedy stems from watching someone completely unpredictable and comfortable being who they are. Tommy is unapologetically himself which is both hysterically funny and inspirational; each scene is a ride. Although his age and nationality are still undetermined, this film makes the mystery of Tommy Wiseau that bit more human. Viewers, whether fans of The Room or not, are reminded that at the core of it all, he is just a man chasing his dreams, even if his methods are slightly unconventional. This is where James Franco shines. He doesn’t just play Tommy, he transforms into a man whose outward appearance and behaviour disguises his raw emotion. His ability to dominate the screen whilst weaving subtleties in his otherwise eccentric performance is truly captivating. The cast as a whole can’t be faulted, in fact, the resemblance between actor and character is uncanny and, whilst James Franco steals the show, all performances are effortlessly convincing, and it was quite the experience to see Dave and James Franco’s unite on the big screen. This is a film that is rich with Hollywood cameos and, no matter how brief, every performance is worth the time. There is a real sense of unity with the cast, the way they interact on screen and the way they come together to pay tribute to a film that, even if unintentionally, left an undeniable mark on their industry. A unified love for the craft… or in the case of The Room, an attempt at the craft. Franco shines as much in his directorial role as he does in his starring role. Every scene is saturated with detail; even down to the formatting of the credits, the film’s style emulates that of its inspiration, giving it a meticulous level of authenticity. Admirable craft aside, this film sends a message to everyone in its audience – one of a passion like no other. There is something truly heart-warming about seeing Wiseau’s eventual success. It may have taken a few years but everything he worked for from 1998-2003 is achieved with this film, proving that even when the world is against you nothing is impossible. The irony and inspiration of it is: a so-bad-it’s-good movie went on to create an incredibly fun and meaningful masterpiece. The Disaster Artist is out now, distributed by Warner Bros. Pictures.